I have been wanting to grow my own herbs for quite awhile now, but have been a little intimidated by it. I’ve never grown herbs before and know that some can be finicky when it comes to watering. 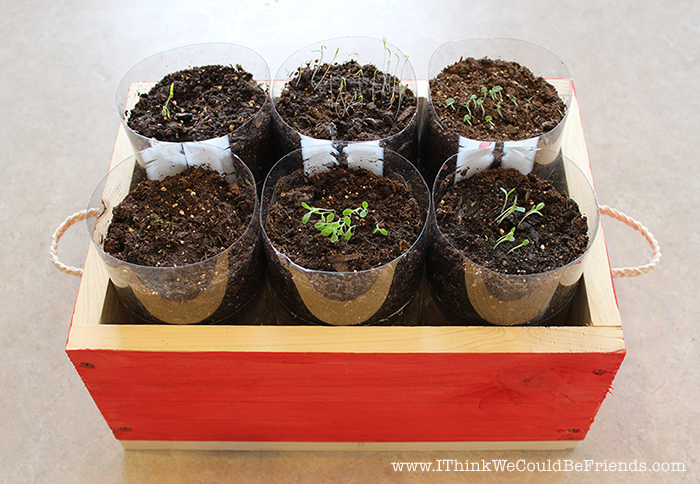 However, after seeing many ideas for “self-watering” herb gardens, I decided to give it a try. 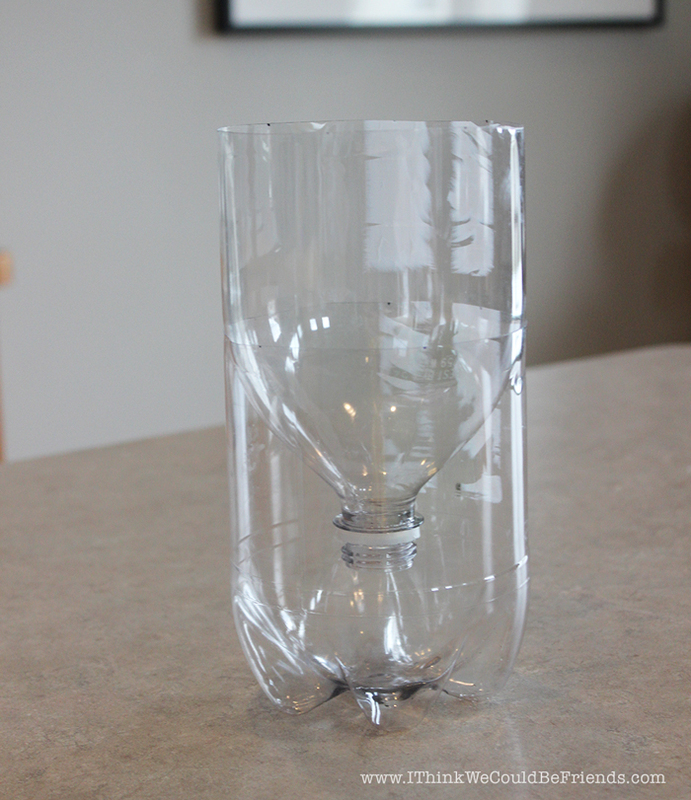 Many versions use wine or other glass bottles, but for the trial run I decided to go with less expensive and easier to cut, 2-liter pop bottles. They came together really quickly and required simple materials that you may already have on hand. I decided to plant Oregano, Basil, Thyme, Rosemary, Cilantro, Parsley and romaine lettuce (not an herb, but wanted to give it a try :) It was also nice that Walmart had organic seeds if that is important to you. I let my kids have a little of the soda before dumping out the bottles, rinsing them, peeling off the labels and cutting them in half (a white strip of the label remained on each bottle…I probably could have found a way to remove it, but have I mentioned lately that I have four kids age five and under? I was trying to get this done before their show was over and they found me ;). I used a knife to start a hole and then a scissors to finish the cut. Next, make your wicks. I used cotton twine from Walmart. 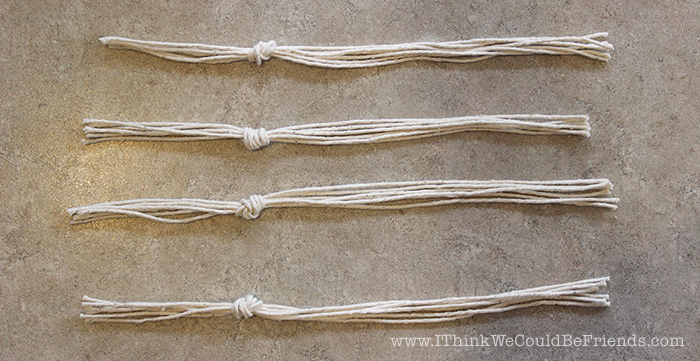 I used six strands in each of the wicks, but now, after testing the containers, 3 or 4 would have been plenty. 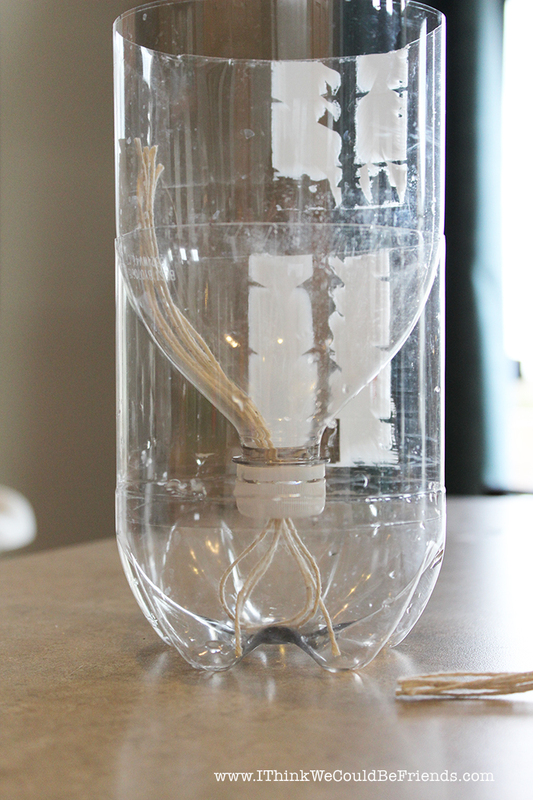 Then tie a knot about two inches from one end (you can test it in your bottle to make sure that it touches the bottom of the water reservoir. Next, drill holes in the caps of the bottles. The size will depend on what type of wick you are using. 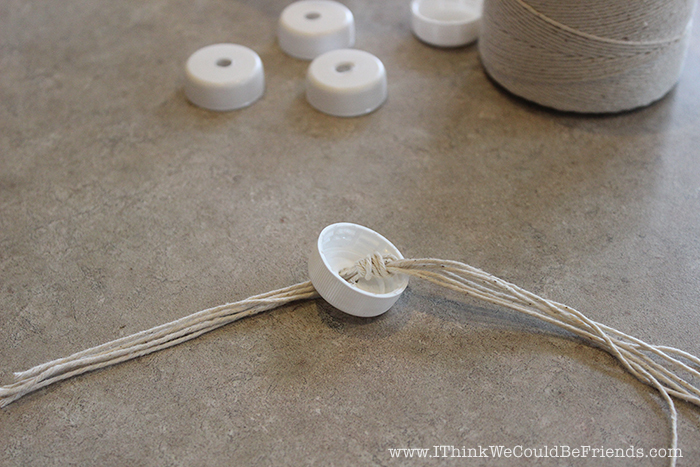 For my cotton string wicks, my husband drilled holes that were about 1/4″ in diameter. Then put one wick through each cap. 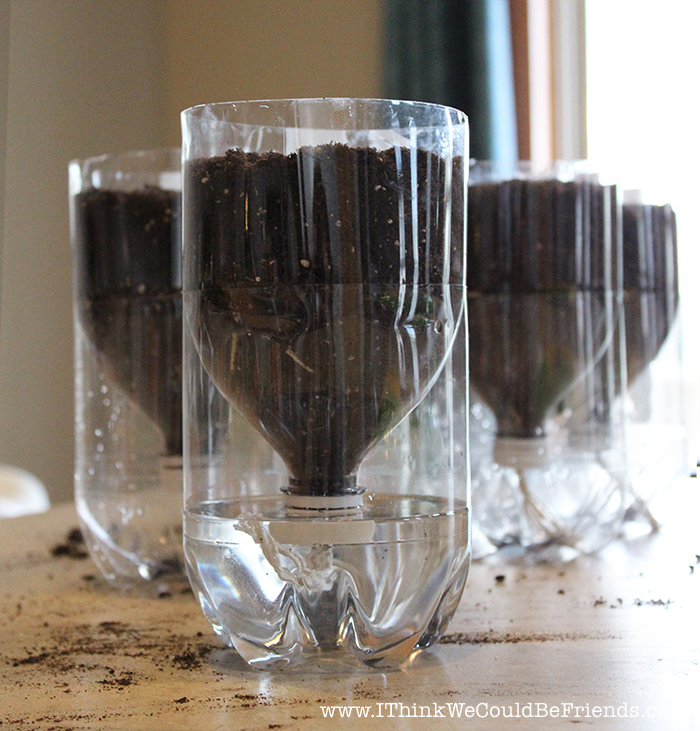 Next, fill each top about 1/3 of the way with soil. 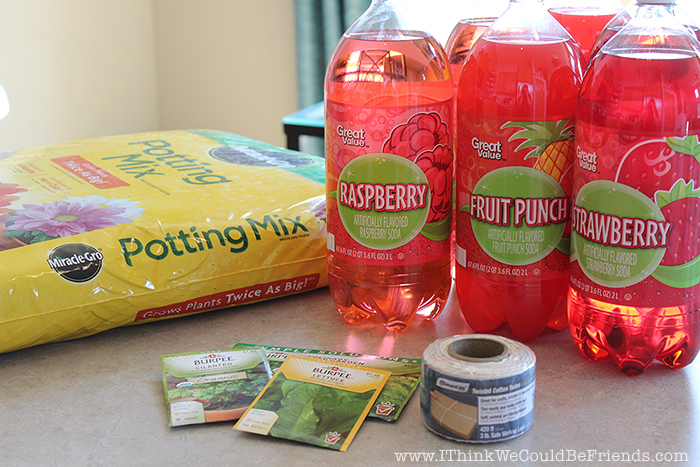 I’m using a bag of Miracle Grow Potting Mix ($5.97 at Walmart…this isn’t sponsored by Walmart, it is just the closest retailer to our house :) Each bottle only holds about 2 cups of dirt, so we hardly put a dent in this big bag, you don’t need much. Then spread out the strands of the wick and continuing filling. I stopped about an inch below the top, I didn’t want them to get too full. 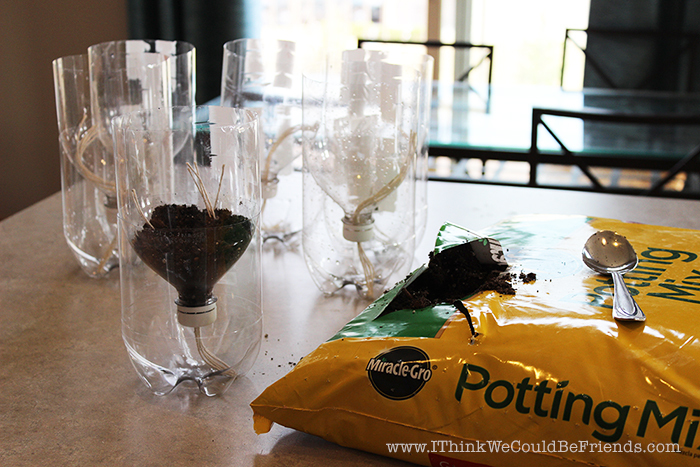 Then, when they are all filled, plant your seeds and add water to the base. The amount of water that you can see in the containers below (three inches or so) lasted almost two weeks. As the plants grow, and as they are placed outside in the sun, they will use more. And then wait…and in a week, look what we have! The lettuce was the first to appear, the others were a little slower (the packages say that they all take 7-14 days for germination). I made these as a birthday gift for my aunt, so unfortunately I don’t have a picture of them when they were more mature. You’ll notice that some appear wetter on top then others, if they seem like they are drawing up too much water, just clip off a couple of strands going down to the water. And don’t worry if the top is dry as long as water is disappearing from the bottom. As the plants grow, the roots will find their way to the wick, so the top doesn’t have to be wet for them to get all of the hydration they need. 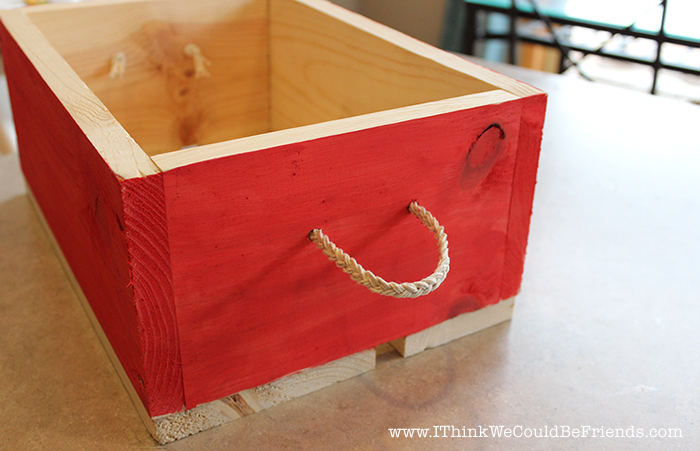 Talk the sweet carpenter in your life into making a crate or box to put them in. This time of year, the weather is still highly unpredictable in Minnesota, so the crate allows for them to be easily taken inside or out. 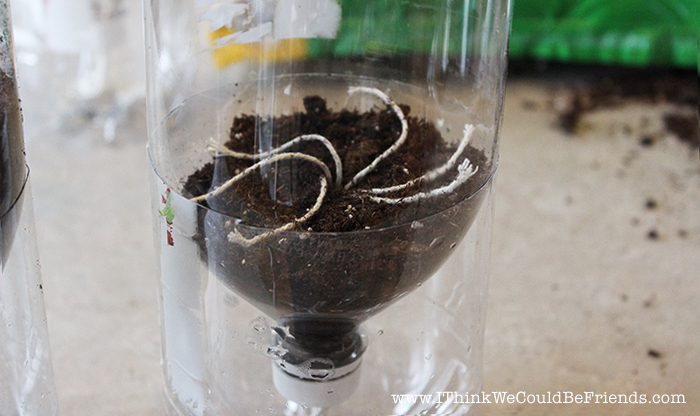 Once the seedlings appear, make sure to thin them according to the directions on the package. I’m going to make another set to have at my house, I’ll be sure to post more pictures of how they grow and adjustments to the process if need be. I had to read several (several) tutorials to get the complete picture of how these work, if I missed any steps, or if you have a question or suggestion, please leave it in the comments. MOST POPULAR RIGHT NOW: The Laundry System that Changed my Life!! >> STOP a COLD in its tracks!! The BEST Natural Cold Remedy! Can I share this idea on my own site, its Finnish one for our school project about sustainable development. 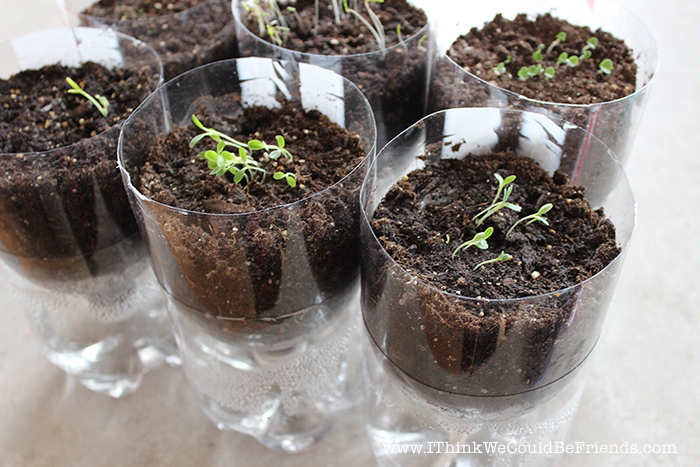 We got there all plants you can grow at home so this would be ideal to share there. I was thinking shearing it via link so you’d get all the credit. Not trying to steal your idea! I did this with my class this past spring, we planted some flowers and they all got to take theirs home at the end of the school year. They had a blast with these planters. I will do this again! Thank you for the tutorial! I was wondering one thing though, how do you add water?? Yes, how did you add the water? 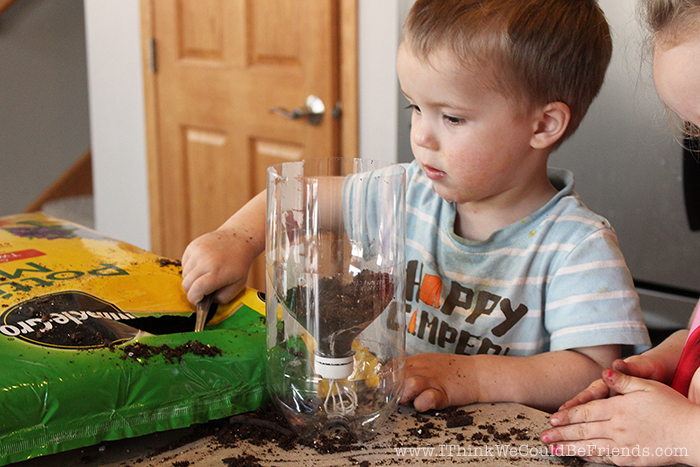 Just lift the upper portion (with soil and plants) and pour some water in to the lower portion so as to keep the water level just below the lid. Alternatively you can use a syringe and needle to fill water to the lower portion by pricking the portion where there is space in between both the portions. To more easily lift out the potted part, I just made tabs that stick up from the sides, and wrapped with a bit of tape. Like this: https://www.dropbox.com/s/xptj987gkdgmqox/IMG_1441.jpg?dl=0 only this is a variation of the same idea, only for a planter you already have, but it want to be self-watering. Anyway, I like your idea for seedlings and young plants that you want to see taking root. Oh that’s a great idea! Thank you for sharing! I love this!! I’m featuring you tomorrow!! Thanks for sharing on My 2 Favorite Things on Thursday!! Hope to see you tomorrow! Pinned! 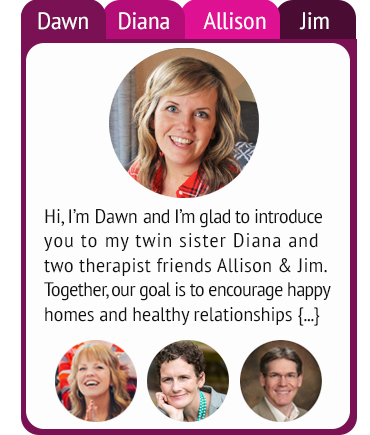 Hi Dawn (and friends)! Thank you so much for sharing this super idea at Thriving on Thursdays. What a great tutorial and a fantastic idea. I’m definitely going to try this. I’m featuring this one at tomorrow’s party. Hope to see you again. Simple yet brilliant. I love it!!! Thanks so much for taking the time to link up with us over at the #HomeMattersParty – we hope to see you again this Friday! Feel free to bring a friend! 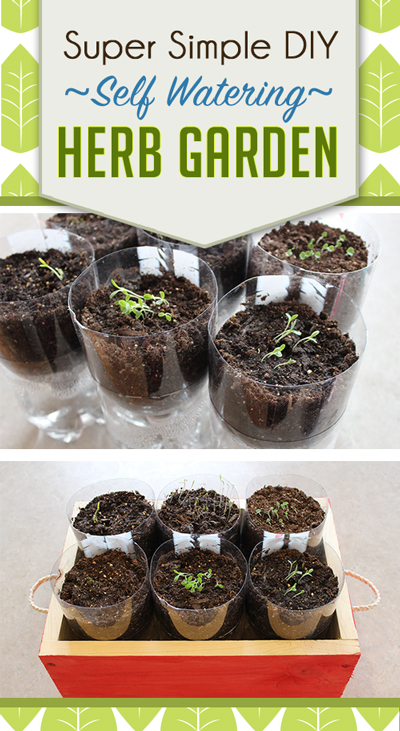 We love growing herbs, especially from seed. Nice idea. We are so glad you shared with us at Merry Monday! I’m looking forward to your newest additions to the party next week! What an ingenious idea. That is a great idea. I am pinning this. That is such an awesome idea! We do not have that many 2 liter bottles at home, I’m saving this for later. I would love to give it a try. What a great idea!! 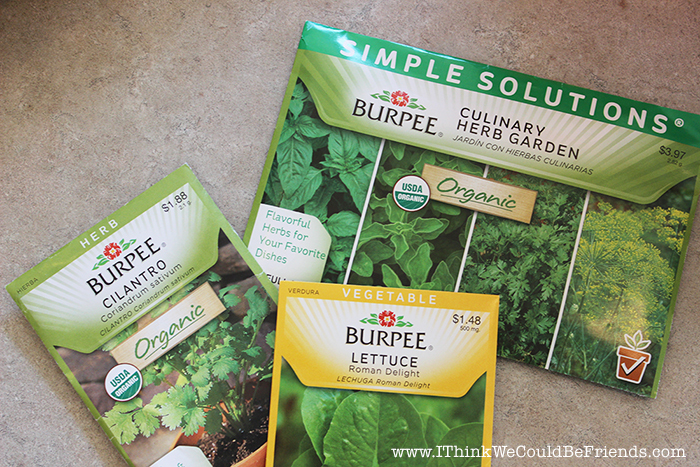 I think this might even work for me, and I have quite the black thumb when it comes to gardening! ;) Thanks for linking up with us at the Best of the Blogosphere! What a great idea! Love the crate that would make it so easy to carry in or out or to just move around your yard. I was going to do herbs in the garden but as a beginner I wasn’t sure if I would know what was an herb and what was a weed (we have a very weedy garden lol) so this is perfect!! Now to get some bottles! Thanks for linking with the creative challenge party! !